As of January 2018, VGB PowerTech has expanded their services for electricity supply with their new oil laboratory. The new oil lab offers all services for oil management with its state-of-the art lab for the analysis of lubricants and insulating oils. 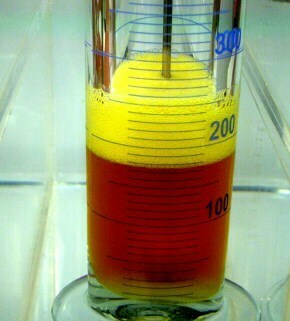 These oils are applied in conventional power plants and in plants for renewable energy conversion as well as in industrial plants and plants of the chemical and steel industry. VGB-S-036-00-2017-04-EN - Preservation of Steam and Gas Turbo-Generator Sets - Now available as eBook! 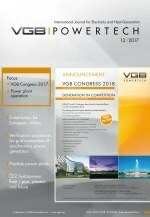 The VGB Innovation Award of the VGB Research Foundation is endowed with 10,000 € and is presented on the occasion of the VGB Congress POWER PLANTS - “Generation in Competition” 2018. Based on the award guideline, all VGB member companies as well as the members of the Scientific Advisory Board of VGB have the right to propose candidates. Deadline for proposals is April 30, 2018. The VGB Job Market is offering prospective persons the possibility to develop their career in the field of generation and storage of power and heat. You can find current vacancies on our homepage. The joint research project "Calculation methods for boiler components" started at the beginning of the year and will run for three years. The aim is to develop methods for stress calculation of thick-walled components and welded joints as well as for the service life calculation of start-up and shutdown processes, taking creep fatigue interactions into account. At the same time, tests for verification of P92 components are carried out. The results are then to be incorporated into the relevant regulations. The calculation methods could be used to identify over conservative or nonconservative calculations of critical components. In the long run, this would result in longer inspection intervals, enhanced component reliability and increased power plant flexibility. The joint research project is funded by the German Federal Government (BMWi). The VGB research project on the load behaviour of buffered and unbuffered sealing surfaces of valves in 600/625°C power plants started at the beginning of the year. The aim of the project is to determine the cause of cracks in valves and the influence of flexible operation. In thermo-static and thermo-cyclic tests, samples from different materials are tested up to 10,000 hours. At the end of the two-year project, a recommendation for the welding process of sealing surfaces with and without buffering is to be made. This could reduce production time and costs for the manufacturing of hard-faced sealing surfaces of valves, minimize pipe and turbine failures in the future and support flexibility of power plants. The purpose of this VGB-Standard is to describe the avoidance of damage to steam and gas turbo-generator sets and their ancillary systems as a result of corrosion which may occur during erection (field assembly, cold commissioning prior to first start-up) and plant outages. This standard provides operators, manufacturers and planners with a basic framework on how and to what extent the steam turbines, gas turbines and generators are to be treated.